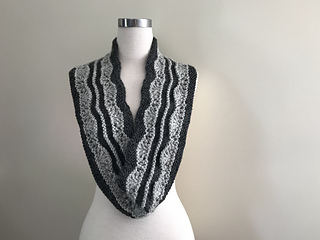 An elegant two-colour cowl designed to enjoy the warmth and lovely drape of Adagio Mills 12ply (bulky) alpaca yarn. 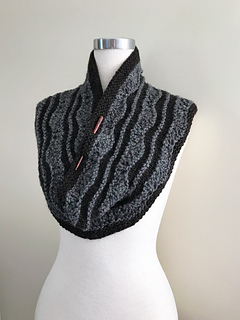 This cowl is worked in the round and features simple lace, garter stitch, and stocking stitch. The pattern is written for 2 versions: A for single loop and B for snug double loop. Both versions A and B require the same amount of yarn. Fully written, this pattern also comes with a handy tick-sheet showing pattern placement, colour changes, chart and lace repeat. In fact, you can work the whole pattern from the tick-sheet alone so it’s a great travel project. C1 (Darker colour): 100g of Adagio Mills Alpaca 12ply which is 96m/104yd per 100g (I used col. Bay Black for version A and col. Stormy Grey for version B). C2 (Lighter colour): 100g of Adagio Mills Alpaca 12ply which is 96m/104yd per 100g (I used col. Stormy Grey for version A and col. Clouds for version B). Pair of 6mm (US 10) circular needles and 5mm (US 8) (optional - see Overview). I recommend either a 60cm circular needle, or 2 x 80cm circular needles if you prefer to knit using the magic loop method. Version A: approx. 85cm (33.5”) circumference, 22cm (8.75”) tall (unblocked). Version B: approx. 106cm (41.75”) circumference, 14.5cm (5.75”) tall (unblocked).